A new chassis system is launched today at Eurosatory by Texelis on stand C268 in Hall 5A. The unit, called the Texelis Platform or TXP family, has been designed for armoured vehicles up to 18 ton gross vehicle weight. Texelis Platform or TXP family, launched at Eurosatory 2018, has been designed for armoured vehicles up to 18 ton gross vehicle weight. The chassis includes everything from the wheels through suspension, steering, powerpack, transmission to the dashboard and all the vehicle mobility electronics. transmission to the dashboard and all the vehicle mobility electronics. 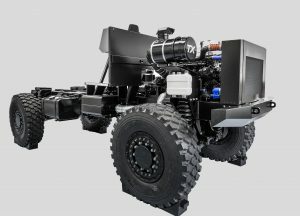 Combining leading proven, in-production subsystems from suppliers including Cummins, Powerline and Allison, the chassis provides customers with the ability to mount their own designed hull onto a chassis designed to meet the requirements of a rugged 4×4 off road vehicle. “We identified during in-depth market analysis a global requirement for a 4×4 chassis system as an alternative to the current ageing and lightweight offerings,” said Jean Vandel, Business Development Director at Texelis. “The TXP 14&18 Platforms combine recent developments in automotive technology to provide the user with a reliable, advanced mobility solution onto which they can mount their own hull design. “We see the chassis as the base of a range of vehicles from patrol, through C4ISR, medevac, logistics and recce,” added Mr Vandel. The system will be provided in two versions. The TXP 14, using a Texelis and Timoney designed T700™ axle system, is for 14 ton GVW vehicles and the TXP 18 using the Timoney T900™ for vehicles up to 18 ton. The two versions give users the opportunity to capitalise on a common running gear and hence reduce the logistics and support requirements. The TXP platform is fitted with a Cummins 6 cylinders and an automatic Allison 6 speed gearbox, an independent suspension system, a hydraulic steering system, All Terrain Rubber Runflats, ABS brakes and a central tyre inflation system (CTIS).